Better late than never eh? !I’m joining in with the #theseamstresstag that is going viral around the sewing community well a couple of months ago!? This is the brainchild of Holly from Holly Sews and I have seen various other people take part such as Claire from Penguin and Pear and Gabby from Gaberdashery. Well I’m Sally Kendall aka The Yorkshire Sewist! I’m 31 (or as i see it 21 + 10 hahaha!) I’m married to my childhood Sweetheart Brian and we have 2 Sons. I live in East Yorkshire in the United Kingdom. I’m an Avid Sewist, Simplicity Sewing Expert and Proudly part of The Sew Crafty Design Team! 2. When & why did you start sewing? It was back in 2014 after i got fed up with Card Making and wanted to try something new as I’ve previously made Jewellery too but got bored….again! So I’ve been sewing for nearly 3 years now and that’s a record compared to my other hobbies! 3. What is your favorite or proudest make? My favourite make has to be dresses, you can never have enough cute dresses but my proudest make was my 1st Bra and Knickers set that i made a Tutorial for Simplicity which turned out beautifully and has spured me on to make more! 4. What is your most disastrous make? You have to have mistakes to learn from them and oh yes there have been a few especially in my 1st year of sewing. It was figuring out what adjustments to make for certain brands of Sewing Patterns as i am petite i tend to find that i need to make a narrow back adjustment and to alter sleeves and lengths of garments! So it’s all about learning and to make a toile! 5. Where is your favourite place to go fabric shopping? Definitely B and M Fabrics and also the indoor markets in Leeds its that bad they know me!! 6. What is your most used pattern? I usually to try and mix things up and don’t usually make the same thing twice but i have made the DixieDIY Ballet dress 3 times now so i’m thinking that’s my favourite! It has to be unpicking especially if I’ve been rushing and not paying attention and sewed a sleeve the wrong way round and you have to unpick all the stitching and then pin and sew again! Argghhh!! 8. And your favourite sewing task? As weird as it sounds i love inserting invisible zips! Yes i’m peculiar but i love the end result of a lovely placed in zip! 9. What is your favourite ‘sewing entertainment’? I don’t really have a ‘sewing entertainment’ Maybe have the TV on but i don’t watch but then i sew in the Living Room soo there is a lot of background noise from the Family! Now i love both! If i’m that eager to get sewing it right away I’ll buy pdf as long as it about 20 pages max but if its a big pattern i.e. a dress then ill wait for the paper pattern as i’ll be there all night otherwise lol. Singer Quantum Stylist 9960 that my hubby bought me for my 30th. Its a super duper digital machine and love the auto thread cutting feature and speed settings. Also have the Singer 14SH754 Overlocker that I’m learning to use bu it is fantastic for finishing off seams and sewing with Jersey! 12. Do you have any other hobbies? ← I’m featured in Sew Style Essentials Magazine! 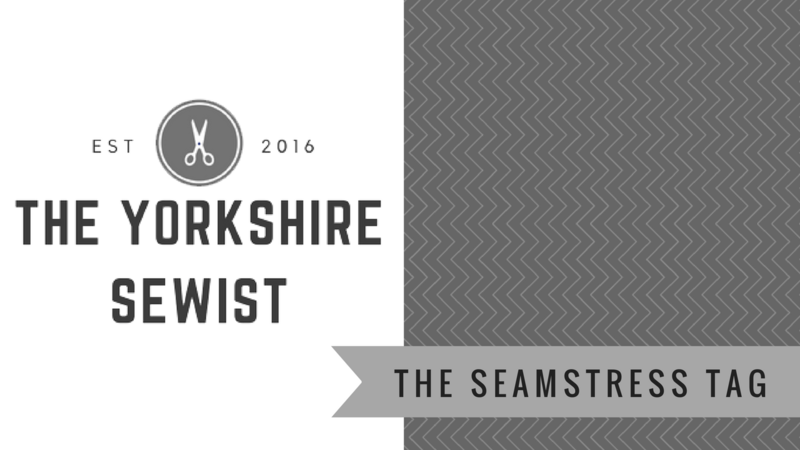 Have just started a blog so maybe I should do the #theseamstresstag too!